Riogordo Volvemos otra vez – Back again! Riogordo Ethnographic museum, Malaga Province. 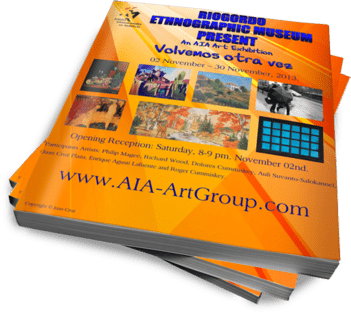 Opening Reception: Saturday, November 02nd. 8-9 pm. 02 November – 30 November, 2013. Participants: Philip Magee, Richard Wood, Dolores Cummiskey, Auli Suvanto-Salokannel, Juan Cruz Plaza, Enrique Agusti Lafuente and Roger Cummiskey. Riogordo is a small town and municipality of around 3,000 inhabitants in Málaga province in the autonomous community of Andalusia in southern Spain. It is situated in the centre of the comarca of Axarquía that runs east and inland of Málaga as far as Nerja. It is located 40 kilometers from Málaga and 30 km from Vélez-Málaga. Nestled in the low-lying mountains (between the Montes de Málaga and the higher sierras), it is almost one of the classic Andalusian “white villages”. It is equidistant between Málaga and Vélez-Málaga, both of which are little more than 30 minutes by car.